Film Synopsis - Captain Marvel (2019) This film is an action genre film which is planned to be published in March 2019. The superhero film Captain Marvell is the first superhero film by the MCU (Marvell Cinematic Universe) whose main character is a woman. This film will later tell the events before the formation of the Avengers. Captain Marvell is a former female pilot named Carol Danvers. Carol Danvers has superpowers after he had an accident when he joined a space team mission called Starforce. In this film, you will be presented with footage of Captain Marvell's nostalgic moments while he was still serving as a pilot and will also be shown the childhood of Captain Marvell in the 90s, this film set in the era of the early 1990s. Marvel Studios chairman Kevin Veige said that the battle scenes in this film were the inspiration for action films in the 1990s. Carol Danvers is one of the most powerful heroes in the universe when Earth is trapped in a galactic war between two alien races. This trailer for action, adventure and Sci-Fi genre starts with the appearance of a woman from the dark night sky, penetrating the earth's atmosphere, burning, and fell to the roof of a building. Yes, he is Captain Marvel. 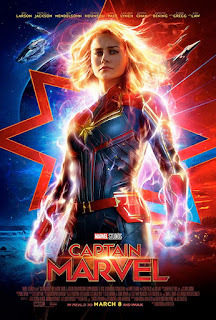 0 Response to "Captain Marvel (2019) Movie Review, Synopsis, Trailer"